John Armstrong’s The Conditions of Love is obviously far from through with me, and I with it. My encounter with this writing has challenged me in so many ways. Principally, I think, in querying my bases of knowledge in neuroscience, literature, philosophy, psychology and art – and struggling what is known (or supposed, or observed) in these disciplines toward our lived experience of love, of loss, of change, of survival. Our brains, our stories, our bodies are all so very highly attuned to patterns in our world, perception, experience…how does that work itself out in our lives of loving and losing, changing and adapting? What is difficult, what is beautiful in such behavior and practice? What do domain-specific, developed human disciplines offer us in our mind/body organismic goings-on? Enormous changes…you could say…REQUIRE all sorts of perspectival changes. Our experiential/perceptual “worlds” have been aptly described and ascribed as Umwelten (see also – Paul Bains, Primacy of Semiosis). In drastically simplified form: the concept that we are (each sort of organism) evolved in such a way as to perceive and engage with that in our environments that pertains to our survival and flourishing, our continuance of existence. Those elements or that structuring and interacting with what we select out of our replete environments and surroundings – including ourselves – constitutes our Umwelt – our little “life-world” – species-specific bubble of “reality” (what is real to us, for us). The sorts of change(s) that provoke potential for maturity tend (I think) to be changes that evince larger (or larger-scaled) patterns of experience and events (although all the minute alterations ever occurring – to the attentive and aware – also constitute mature adaptations for the human – the meditator recognizes the flux in each moment and works to adapt to this flux with openness and acceptance) – in other words, such things as by their very occurrence create/disrupt/introduce significant and substantial structural alterations – profoundly unavoidable – changes to the content AND context of the individual organisms perceptual/experiential SURROUND. Changes (like those listed above) that, if NOT adapted or adjusted to, evidence a socially recognizable UNreality – a person clearly maladapted to the realities of their situations. An example would be CHANGE or DIE; ADAPT or FAIL in some socially undeniable sense. ADAPTING – in a “to-obvious-Umwelt-alteration-sense” is what I comprehend as an instance of maturity (a la Armstrong). Maturity then is our relatively accurate adjustment and adaptation to – our expectations and perceptions – to the “realities” of our ALWAYS-changing life-world. 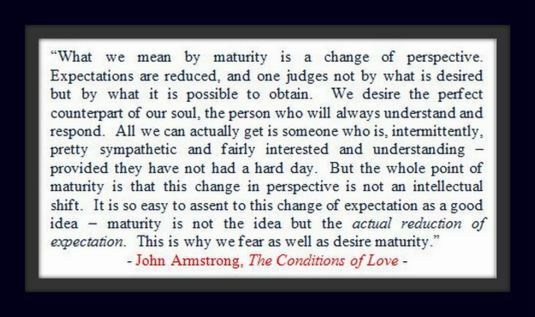 I think Armstrong is right that we have a love/hate relationship to maturity. It is something I (we?) HATE and HOPE for – the changes in our personal and public worlds so mostly beyond our control – air quality, abandonment, accident, reward, attention, ignor-ance, and so on. As he puts it: “maturity is not the idea but the actual reduction of expectation. That is why we fear as well as desire maturity.” I question whether the adaptation is always “reductive” – in some cases, where we tend to be ruled by “patterns” (our past, our available information, our individual perceptions, our nature/culture development, etc.) maturity would constitute expanding, extending and opening our perceptions to the wider, complex and dynamic possibilities of an ever-changing life-world (I think). For myself: I HATE it (the death and loss implied in honest, authentic reductive maturity – mapping my individuality to my actual surroundings and situations) – I often resent and resist the ongoing change – erosion and eruptions – of the world I’m embedded in. AND I WELCOME it – the reality-check of it, the alteration, breath, fresh potentials of “new worlding” that constant change instigates and offers.